Redrum is Reason’s original drum machine. With its built-in pattern sequencer, ten sample playback channels and a huge library of drum kits, it’s a perfect machine to quickly get some beats going. Redrum is really easy to get going with, but carries enough tweaking options to keep the most discerning beatmaker busy. Redrum is a drum machine with a built-in pattern sequencer. Load your own drum samples into its ten channels, or load up one of the included preset kits. In addition to the pattern sequencer, Redrum can also be played from Reason's main sequencer or via MIDI. Use whichever you like, or use both: patterns for the basic groove and the main sequencer for variations and fills. Here is an example channel. 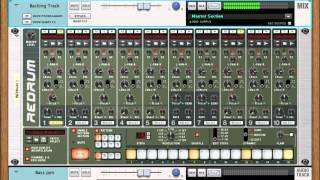 The features for each channel differ slightly to accommodate for various types of drum sounds. At the top there are three play control buttons: play (for auditioning sounds), mute and solo. Next, the sample load section has the expected buttons to let you browse and load samples, but also to sample sounds directly to the Redrum channel, using Reason’s live sampling feature. The pan control does what pan controls normally does: left, right or somewhere in between. The level control sets the volume of the sample and the velocity control sets how velocity will affect the sample's volume. The channel pictured here has settings for velocity control over the sample's tone. Other channels have controls for pitch bend or sample start position. 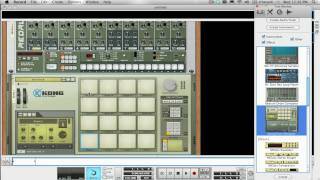 Redrum's beat programming uses the same kind of step programming found in classic machines from the 80s. You select the channel to program and enter which steps you want it to play at. Each step can have one of three velocities: Hard, medium or soft. A separate flam option let's you enter flam at any velocity. Redrum uses patterns that can be between 1 and 64 steps long. The pattern sequencer can be set to run faster or slower than the main sequencer's tempo - in fact it can run 16 times as fast or 1/16 of the original tempo. This means that you can change the resolution of the pattern. By making a pattern 32 steps long and setting the pattern sequencer to run at double tempo, you have created a pattern with 32nd notes. A nice features for those into fast snare rolls etc. Redrum has effect sends with send level settings for each drum channel, making it easy to add effects to drums without having to use up channels and effect sends in the main mixer. A good way to use the effect sends is to create a sub mixer for Redrum (like the Mixer 14:2 or Line Mixer 6:2) and route the audio to that mixer. Then, flip the rack over and connect the effect sends to any effect unit you may desire and route the effect units output to the sub mixer too. This is a clean way of getting processed drum beats to your main mix! Sometimes you may want to use insert effects on the drums, say a distortion effect to the snare or a flanger on the hihat. To do this, you can use the separate outputs for each channel to add any effect you want to any channel. There are also gate outputs & inputs on each channel that you can use to trigger other devices with the Redrum, or to trigger Redrum sounds from other units. For example: use the dead-easy beats programming in Redrum to trigger sounds from Redrum’s more capable big brother: the Kong Drum Designer.